Welcome to this month’s #IMReadalong update, where I’m going to start collecting people’s views on “The Bell” (time has told that a good few reviews come in after the end of the month, for reading or reviewing scheduling reasons, and that’s of course FINE) and then share images of my four copies of “A Severed Head” and their blurbs. 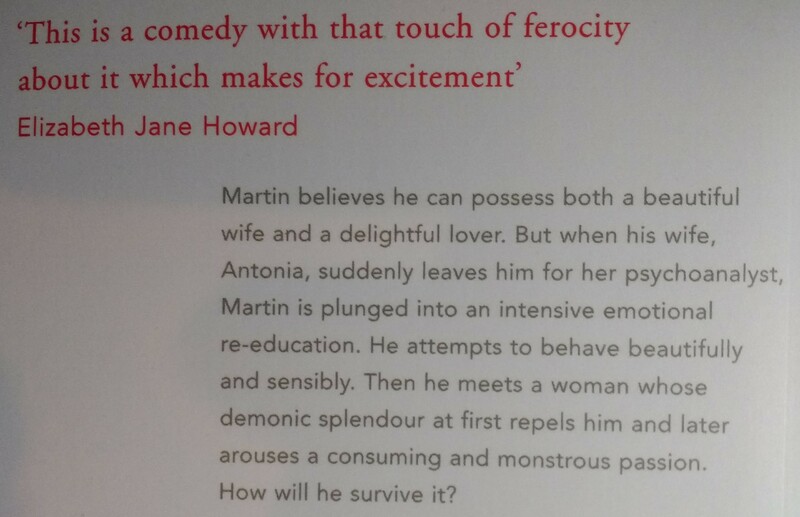 Various people got to discussing “The Bell” as early as my introductory post last month, especially because I was a bit late with my review (I’m starting “A Severed Head” tomorrow to avoid having this issue again). Do have a look at the comments, especially Maria Peacock’s long note. 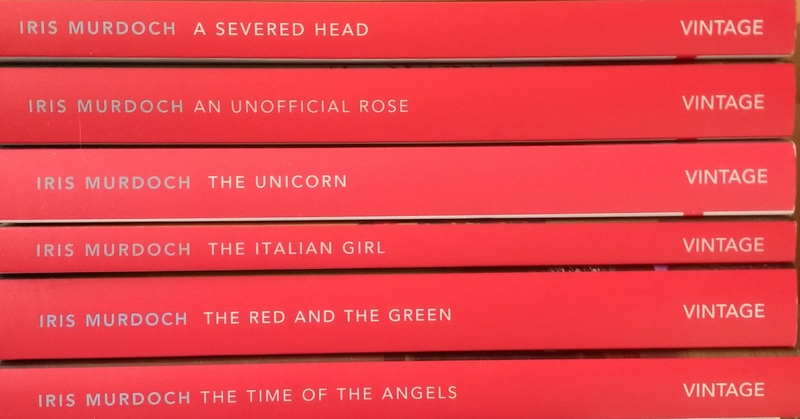 I had some lovely cover images from Peter Rivenberg which I shared on my review post, and there has been a bit of discussion there. Jo has put up another excellent review on Goodreads and I particularly liked her contrast of Dora and Toby. Liz also reviewed it on Goodreads and wasn’t so keen – which is fine, of course, and I’m sharing here to reassure anyone else who had trouble with it. Juliana from The Blank Garden has added an amazing discussion on whether IM is a philosophical novelist, centring on this book, here. Any more reviews or links to reviews on people’s blogs and Goodreads accounts will be shared them here when they come in. So if you have comments to make or links to blog posts to post, you can put them here or (better still) on the review. Oh, and do pop over to my “Flight from the Enchanter” round-up where I’ve just had to add a picture of the very sweet Penguin I acquired the other week. 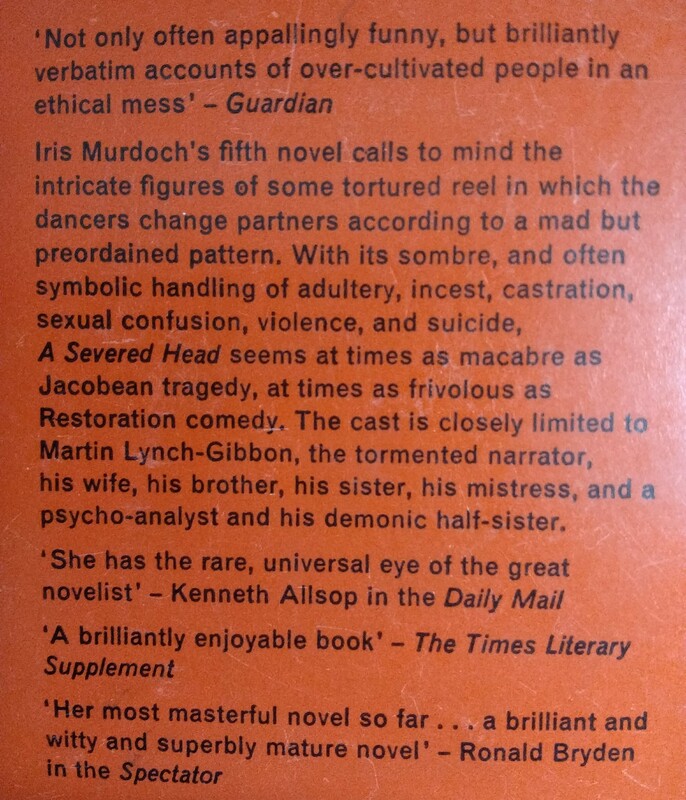 Moving on to our March read, this is, almost inexplicably, the first Iris Murdoch novel I read, at the age of 14 (an only child who went to an all girls’ school and led a pretty sheltered life), and which got me hooked on IM. What on earth did I make of it? It was loaned to me by my lovely neighbour, Mary, who was a bastion of left-wing, wine-making, vegtable-growing, borrow-any-book-on-my-shelfness who introduced me to so many of my still-favourite authors. I have four copies: the hardback first edition, a 1964 Penguin whose cover I LOVE, a 1984 Triad Granada which I bought in about 1986, and the new Vintage edition. … and the Vintage has a puff from Elizabeth Jane Howard of all people, and a mixture of all the previous blurbs. So, are you going to be reading or re-reading “A Severed Head” along with me? 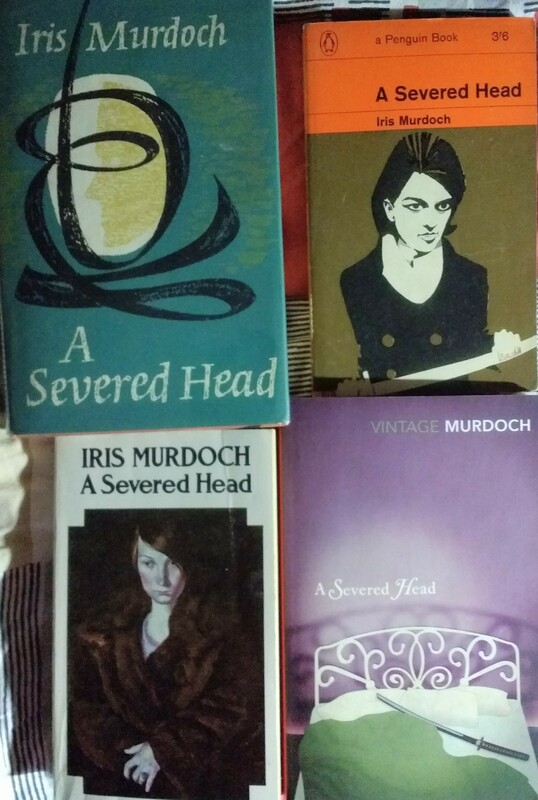 Which was your first Iris Murdoch novel and which was the one that got you hooked? way through listening to Derek Jacobi reading it. Need I say more! Shall be reviewing it later. …thanks for suggesting we compare reading and listening experiences, Liz. I’m sorry, I thought they would be expandable and will see if I can make them so. That’s quick going – I’ll watch out for your review and link to it in mine or you can pop a note in the comments once I’ve read and reviewed it. I hope you’re enjoying it – sounds like you are. What a perfect narrator! Don’t worry about altering the blurb. It’s the colour not print size that’s the problem. I will you and print it and see if that helps.. as for the speediness, I was looking for my next reread so this was a perfect opportunity. I’ve sent you the photos in case that helps. And I can’t wait to hear your thoughts on it! Hope you enjoy The Severed Head, again! It’s one I have read twice. I remember you enjoying it. I can’t wait to get started, hopefully tonight. Oh dear! Well, A Severed Head is one of the shorter ones … But it’s also fine, just read, review and link when it comes to the point where you can do it! I’ll be on board for this one. 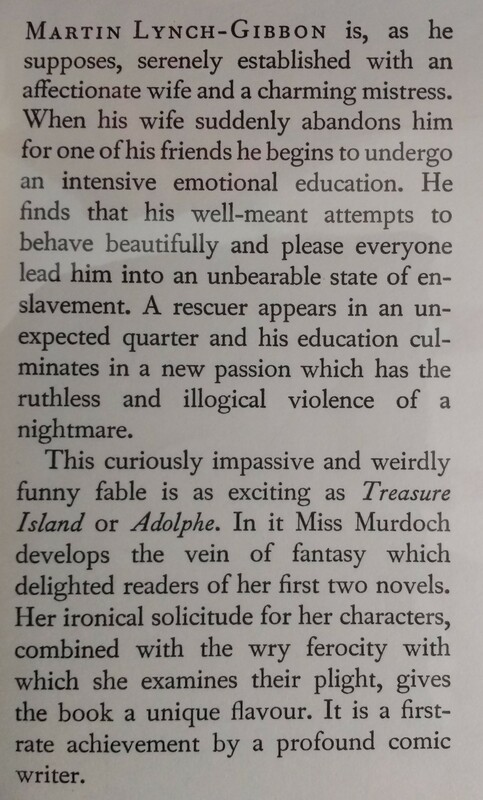 I like the description “curiously impassive and weirdly funny,” but I really can’t imagine an Iris Murdoch novel ever being like Treasure Island! My copy has a hideous photographic cover. I’ll be sure to include it in my review. I know, a completely weird comment. I love the hideous photographic covers, and am looking forward to seeing that, and am glad you’re joining us for this one! I obviously decided to get that one as it has a 1968 birthdate, just like me. Oh, that’s a great one, I love that one and am really looking forward to it. Her only mystery! I just picked up my library copy on Saturday afternoon, the first edition one you have, but perhaps in not as good condition as your copy (certainly it’s been read a LOT). It’s a reread but, based on all those cover descriptions, I’ve never read this book before – heheh! 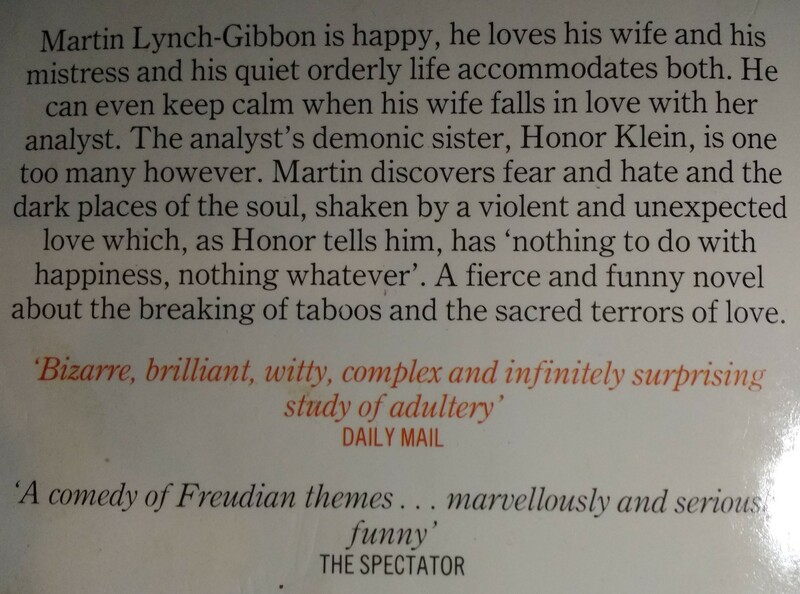 I find the blurbs so odd sometimes! Certainly the Treasure Island comparison is a massive red herring! Hope you enjoy it! I’m working on my revire of A Severed Head which I have listened to on audio read brilliantly by Derek Jacobi so that we can compare the different reactions between audio and reading print. Have found it fascinating. I honestly can’t think of anyone better than Jacobi to narrate this one. Can’t wait to compare reviews!